The "Eye of the Wind" will take you on a tour through sub-tropical vegetation and volcanic desserts, through great mountains and volcanoes, green valleys, traditional villages and lovely cities. 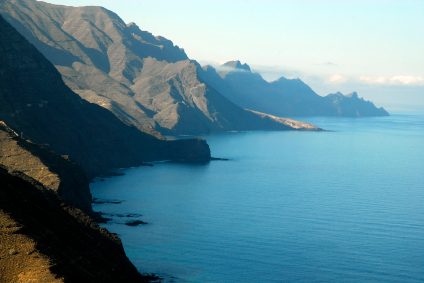 Already the famous natural scientist and geographer Alexander von Humboldt was overwhelmed by Teneriffa’s beauty. 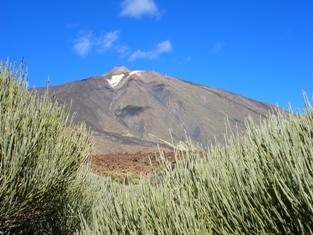 This gorgeous island overtopped by Spainâ€™s highest mountain which is the Pico del Teide (3.718 m). A little bit lower at a height of 2000m above sea level you can find the impressive crater landscape "Las Cañadas del Teide". 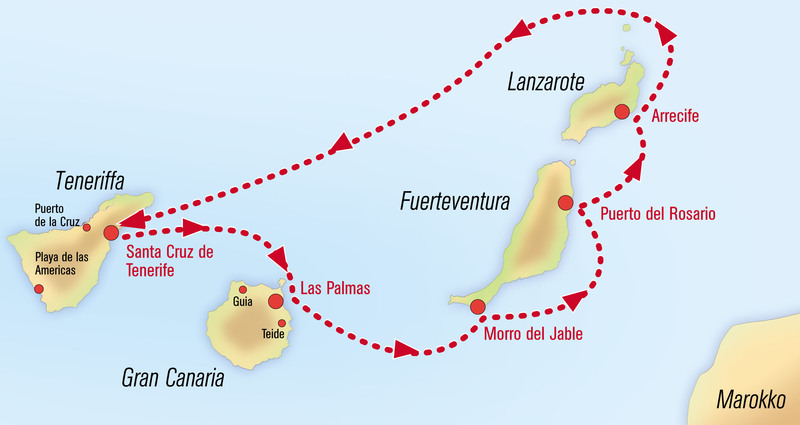 On Gran Canaria you will be enchanted by numerous nature and adventure parks. The unique ecosystem, its flora and fauna as well as geological formations in the more than 32 nature preserved areas need to be paid special attention to. The south of the island is more characterized by tourists but still you can find great landscapes like the dunes of Maspalomas. Here the sand that is brought by the wind from Africa forms a miniature of the Sahara Desert. In the mountainous center of the island you will find fertile valleys and dams. Water and wind formed numerous "Barrancos", steep canyons that reach from the mountains to the Atlantic. Furrowed hillsides and great Canyons illustrate erosions that changed the former volcanic landscape. In the softer rock formations numerous caves developed over time in which cave-paintings can be found that are evidence of its natives. Fuerteventura impresses through its desert lily that promises healing power. Even Kolumbus used the juice of the aloe plant to heal the wounds of his men. Here one of the largest growing areas for Aloe Vera in Europe can be found. The dry and warm climate and 300 sunny days per year support the growth of this healing plant. Relax and lie back in small villages, great mountains and deserted landscapes. 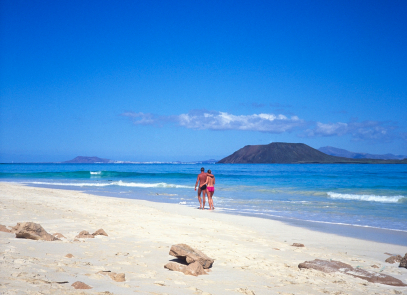 Those almost endless golden sandy beaches are a landmark of Fuerteventura and seem to touch the horizon. 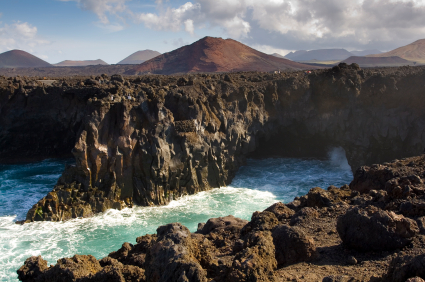 An extraordinary, bizarre and partly rough lava landscape can be found on Lanzarote. The island is covered by lave to three-fourths. The National park Timanfaya offers a good view on those tracks. On some spots the subserviced heat can still inflame hey or evaporate water. 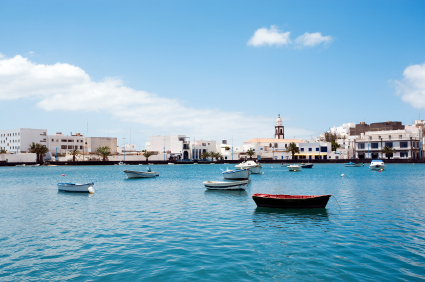 The lava landscape and brilliant white villages whose architecture is characterized by famous in Lanzarote born artist César Manrique divulge a certain flair. There is lots of good wine and many important agricultural growing areas so not only connoisseurs can enjoy the wine here. Even coccids are being bred on Lanzarote to produce the carmine colorant. This is not only used for red lipstick but also the well known Campari is colored with carmine colorant from Lanzarote.